One of our new favorite meals is Shrimp Salad. However it's not like any shrimp salad I've had before. What's different about this shrimp salad is the shrimp is cooked, in Olive Oil... like you would do when making scampi. To prepare, stir fry shrimp in a little bit of olive oil (spice to taste). While the shrimp is cooking prepare your salad (cut up tomatoes & avocado and mix with lettuce). Drizzle a couple tablespoons of caesar salad dressing over the salad. 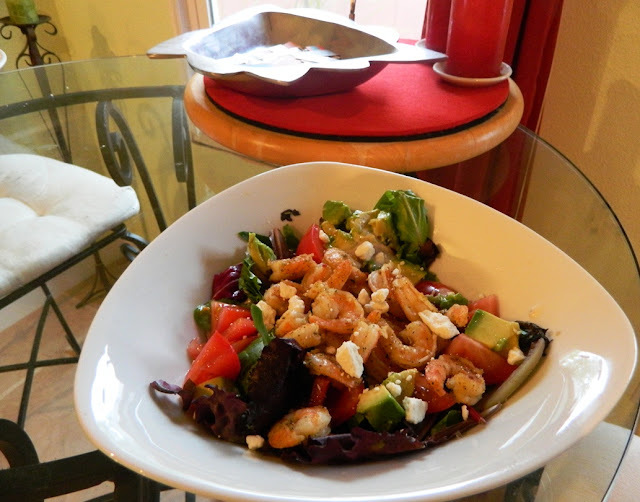 When the shrimp is ready (it shouldn't take more than 5 minutes) place on top of salad. Sprinkle feta cheese over the entire salad. That's it!